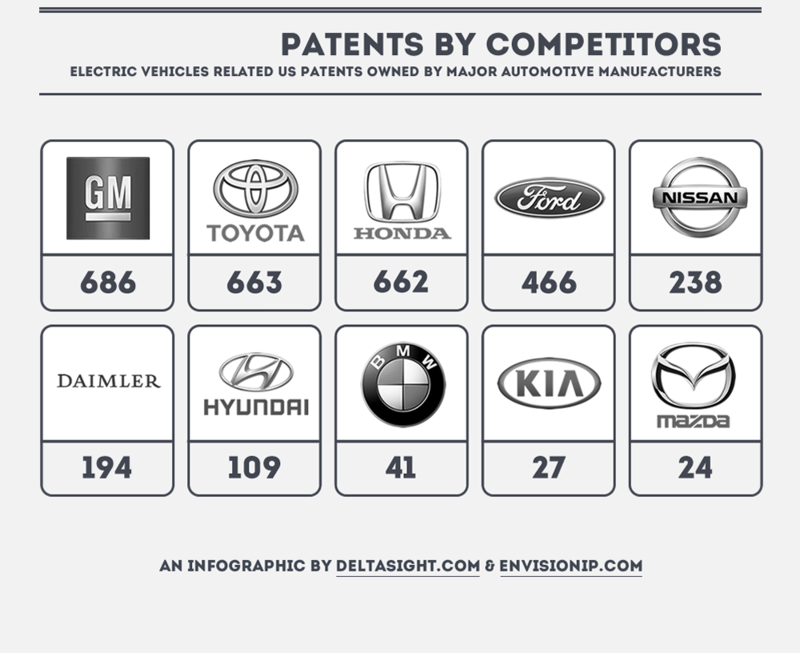 Envision IP partnered with Deltasight to analyze Tesla’s US patent portfolio, in an effort to understand which technologies the company has proprietary rights to. As of June 12th, Tesla had 172 issued US patents, and another 123 published pending US patent applications. It is important to note that this figure does not include any pending, unpublished patent applications filed by Tesla. 120 of Tesla’s patents are related to battery and charging technologies, and not surprisingly, this technology makes up the vast majority of its patent portfolio. Tesla also owns 20 patents related to electric motor and drive control, 10 patents on vehicle frames and chassis, followed by a handful of patents related to doors/latches, air conditioning technology, sunroofs (note the signature panoramic roofs of the Model S), and user interfaces/displays. However, while Tesla may not have much competition in the commercial marketplace for purely electric vehicles, automotive giants such as General Motors, Toyota, Honda, Ford, Nissan, and Daimler have all amassed significant patent portfolios related to electric vehicle technology. Although smaller automotive manufacturers lag Tesla in EV related patents, Tesla is clearly dwarfed by General Motors (686 patents), Toyota (663 patents), Honda (662 patents) and Ford (486 patents) in this area. These companies may not necessarily need, or want, access to Tesla’s technologies, as they appear to have well-established R&D programs and proprietary patented EV technologies of their own. The opening of Tesla’s patent portfolio will not likely be a catalyst for the automotive industry to make a shift towards purely electric vehicles. Traditional auto manufacturers have already invested significant resources to develop EV technology. It may simply be a matter of time before we see an influx of vehicles in the marketplace which directly compete with Tesla’s line up.